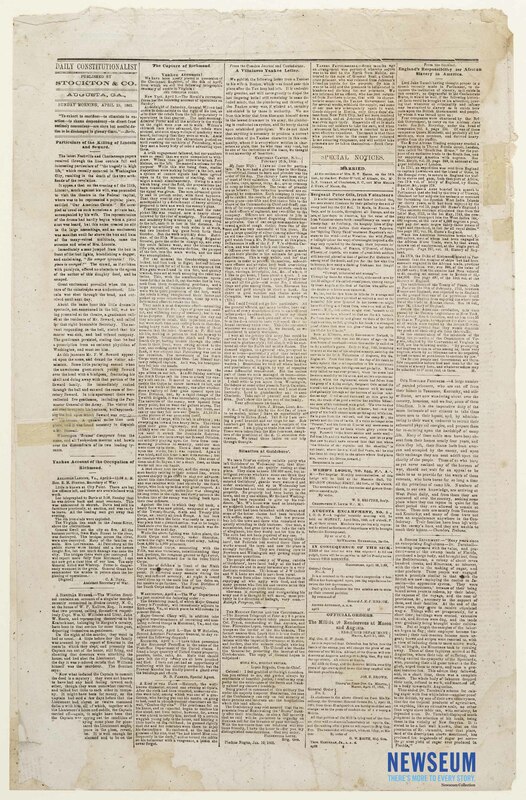 Interior page report of the assassination of President Abraham Lincoln in a Confederate newspaper. The article is titled "Particulars of the Killing of Lincoln and Seward" and it claims the attack resulted "in the death of the two arch-fiends of the revolution." False report of the death of Secretary William H. Seward. Use of this item for research, teaching, and private study is permitted with proper citation and attribution as follows: Courtesy, Newseum Collection. Reproduction of this item for publication, broadcast, or commercial use requires written permission. For permission, please contact us.